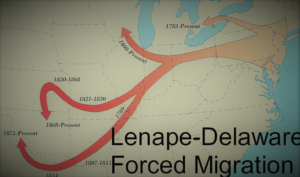 The long history of the Lenni Lenape, or Delaware people as we are now known, reaches far back before the arrival of the Europeans. Since much has been lost over time, it is perhaps best to begin in the forested waterways of the Hudson River Valley. Ranging from “. . . the states of New Jersey and Delaware, that part of southeastern Pennsylvania lying between the Susquehanna and Delaware rivers, and the southeastern part of New York state west of the Hudson” (Weslager 1972: 33), the Delaware people today can be found in small enclaves across the U.S. and Canada. The largest populations reside mainly in Oklahoma and Ontario, Canada, with families and individual tribal members scattered across North America. Perhaps as frontier artist George Catlin noted in First Artists of the West, George Catlin Paintings and Watercolors (Troccoli 1993: 52), in describing the Delaware character and reaction to the continuous push into unknown lands; “No other tribe on the continent has been so much moved and jostled about by civilized invasions; and none have retreated so far, or fought their way so desperately, as they have honourably and bravely contended for every foot of the ground they have passed over.” The Absentee Delaware, “absentee” being a description we were given early on, broke away from the main body of the tribe shortly after the American Revolution. European promises of the inclusion of a 14th state, an Indian state, were made as enticement to sign the first treaty in 1778 between the fledgling United States and the Indians. Of course no Indian state was ever declared and by 1782 continued expansion of the frontier and the violence often erupting from that expansion, compelled the Absentee Delaware to move beyond the borders of the newly formed United States into Spanish territory west of the Mississippi River (Hale 1987:1). In 1793, the Delaware were given a land grant from the Bron de Carondelet, Governor General of Louisiana, which they would share with the Shawnees. This tract of land was located northwest of present-day Cape Girardeau, Missouri, along a drainage known as Apple Creek. After 1815, the Cape Girardeau Delaware (Absentee Delaware) continued south and southwest into Arkansas and the Indian territories while the main body of the tribe continued to reside in Ohio prior to entering into treaties which would bring about their relocation to southwest Missouri along the White River. After the Cape Girardeau group began moving south, they would splinter into three groups; one group residing along the northeast Texas border, others near present day Nacagdoches, Texas, and the third group near present-day Byars, Oklahoma in McCurtain County. These Delaware, along with other bands seeking a place to live, would find themselves removed from Texas three times before eventually settling on Wichita allotments in the Anadarko, Oklahoma are (Hale 1987: 2-5). Known until the late 20th century as the Absentee Delaware, then the Delaware Tribe of Western Oklahoma, we are now the federally recognized, Delaware Nation. “My mother used to say, we came from another island (I guess I will say), not in this . . . She said, “We crossed, we had to go way up in the North Pole, and the ocean was all frozen.” They had to go that way. So, these Delawares did have plenty to eat on, but they ran out of food right in the middle. So they started eating whatever, they were so hungry. Finally, they got on this side and that is all I know. My mother was telling us. That’s all.” The Walum Olum (red score) is our recounting of “where we come from.” Recorded in what are known as mnemonic glyphs (somewhat similar to Egyptian hieroglyphs), these stories were traditionally shared through storytelling and at some point an individual decided to record the stories onto wooden strips. The assumption by late 19th and early 20th century interpreters of the Walum Olum is that the oral tradition was passed down from one person to another although if this selection were based upon clan, family or other means remains unknown. The part which intrigues is within what is called Book Three of the Walum Olum in verses fifteen through seventeen: “All of them said they would go together to the land there, all who were free . . . the Northerners were of one mind and the Easterners were of one mind; it would be good to live on the other side of the frozen water. Things turned out well for those who stayed at the shore of water frozen hard as rocks, and for those at the great hollow well” The mnemonic glyphs were interpreted in the late 19th century by Dr. Daniel G. Brinton, and from his interpretation the Walum Olum suggests two groups of people decided to leave their homelands in what is now modern day Siberia moving across the once frozen Bering Strait southward across the Yukon until arriving at the head waters of the Mackenzie and Columbia Rivers. There one group would move southeasterly over the subsequent generations eventually arriving at Namaesi Sipu, or the Mississippi River. As the first inhabitants of what is now the northeastern United States, the Waopanachke or Lenni Lenape, were known as the grandfathers addressing other tribes within the Algonkian family as their grandchildren. 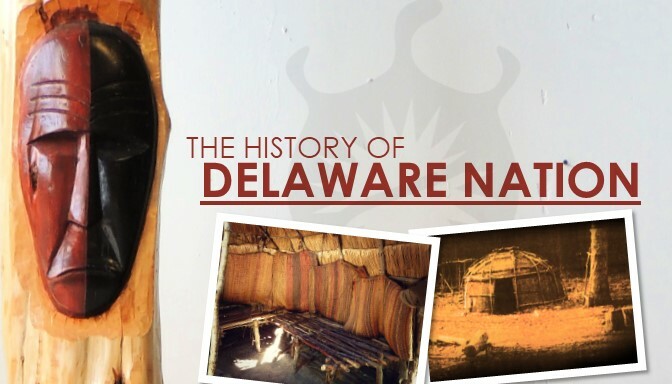 The kinship ties among the tribes comprising the Algonkian group considered the Delaware to be the oldest existing tribe among them which suggests we were the first to occupy the region. According the Walum Olum not all the Delaware people moved into the four rivers area but one group remained along the eastern bank of the Mississippi while another group remained west of the river. From the Delaware who settled in the northeastern part of our continent would come our three clans; the Munsee (Wolf Clan), the Unami (Turtle Clan) and the Unalachtigo (Turkey Clan).